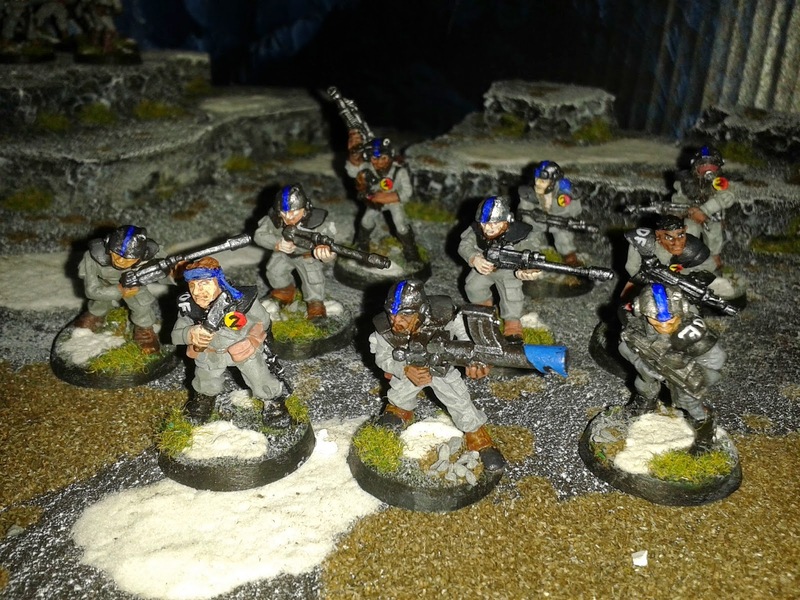 Another Infantry squad from my collection gets the rebasing treatment. Another one bites the dust! Well, the modelling snow and static grass anyway. 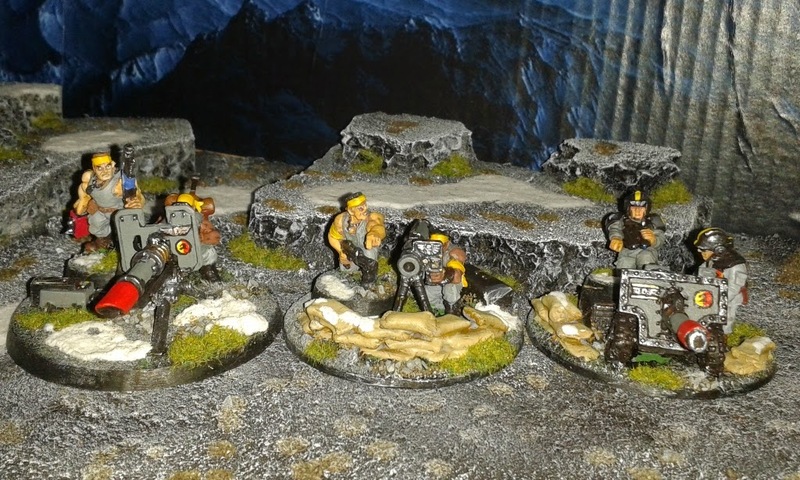 When I built these heavy weapons teams I deliberately based the "loader" models on 25mm round bases so that I could remove them as wound markers. Good plan - except it made more bases for me to redo. I have several of these teams and tend to swap and change models between them so you may notice variations between the "Before" and "After" pics. 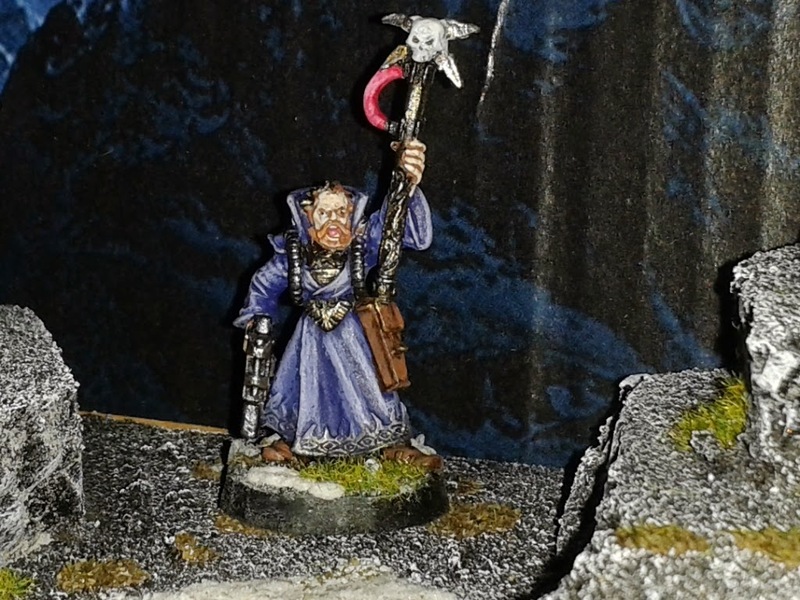 Just one model this time - my sanctioned psyker. I only have one of these guys - I might pick up a unit at some point. I've got a real soft spot for this unit. 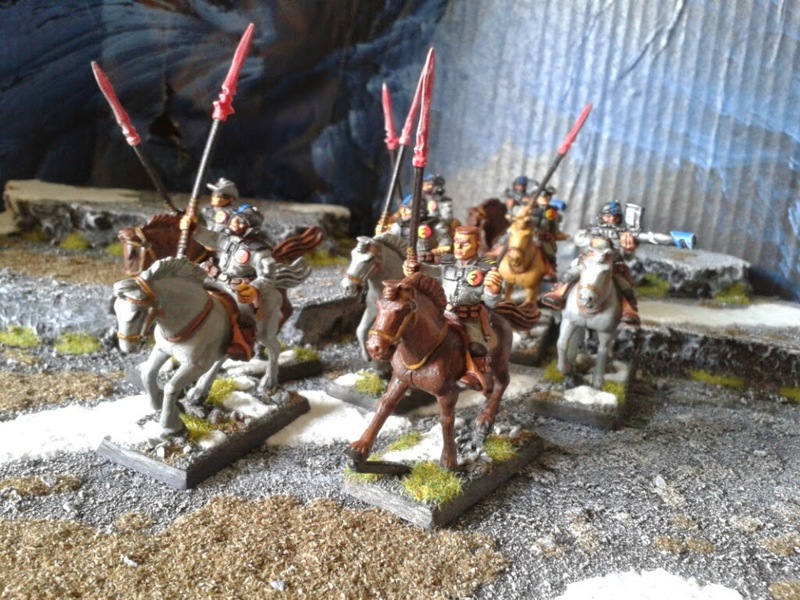 It was the first mounted unit I ever attempted and I was nervous about the horses. At the time I was very pleased with the result (though I could do much better now). On the other hand they have been utterly disappointing on the battlefield: in every game I've fielded them they have been a bullet-magnet. In fact I don't think they have a single kill to their credit and are normally dead to a man by turn two. Another set of models successfully rebased and rephotographed! 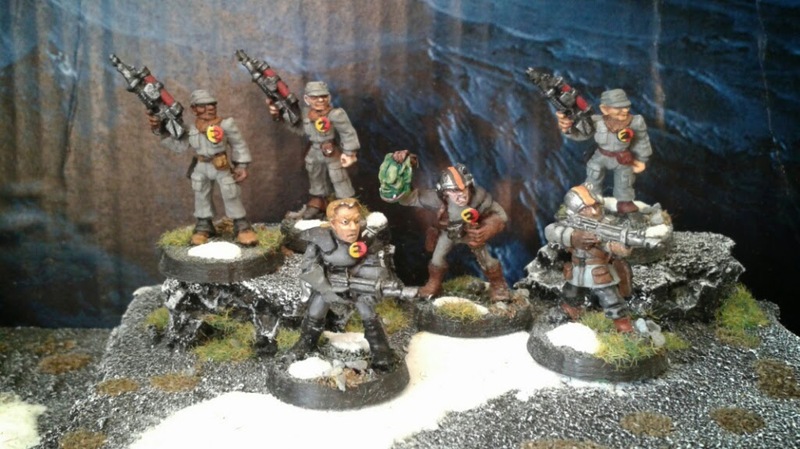 It's at times like these you start to regret creating an Imperial Guard army. My current models total is about 180 (including tanks etc.) so I made a rod for my own back deciding to update this lot. Here is my Company Command squad. 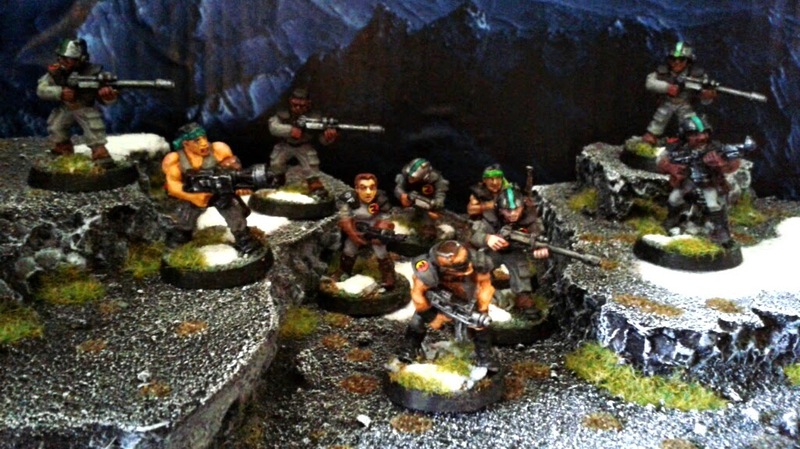 I've moved a few models around in my command squads since I first photographed them. A completely new addition is (back right) a Medic model (looks like he's eating a sandwich!). There has been a small amount of repainting too - the commander's had and cloak have become somewhat less garish for a start! You can't tell from this photo particularly well but I've remodelled the way the Orderly is carrying the banner - previously the banner pole was just clumsily glued to his hand but I've opened the hand up and sculpted some green-stuff fingers to properly grip it now, as well as adjusting the angle at which the banner "blows". I'm not tackling my project in any particular order which is why squad 6 is the first squad to get its bases updated. It was just the first squad out of the box. There are some interesting models in this squad. Front and centre is a model that was possibly a prototype for the modern Catachan models. Behind him and to the left of centre is a female guardsman. To her right but slightly obscured (wearing the headband) is a model certainly borrowing from the aesthetic of the Rambo character (guardsman Marbo? He can be very clearly seen in the photo above just to the right of centre). 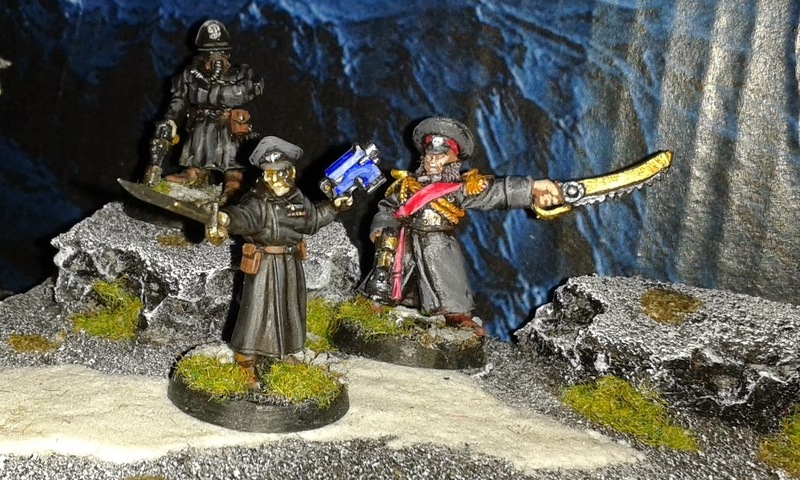 Four of the others are from the original set of Imperial Guard plastics. Here is a squad of special weapons troops; three snipers accompanied by three lasgun-armed troopers. 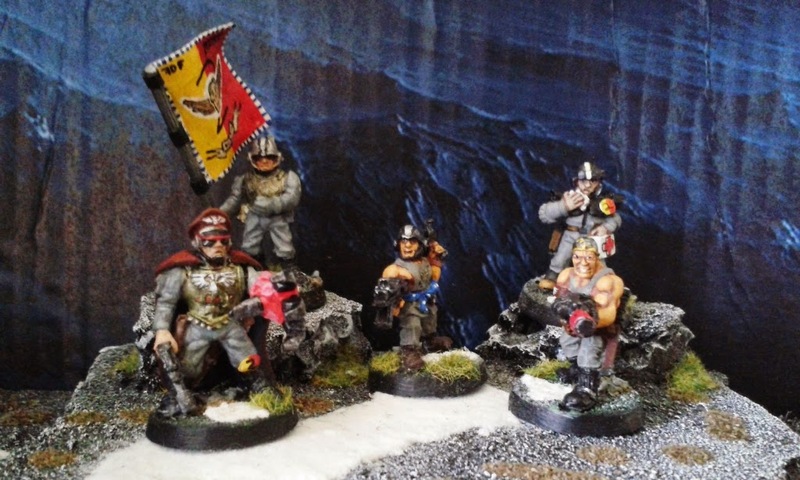 All of the models shown below are vintage Citadel minis. Front and centre of the bottom photo is a female guardsman - not something you are likely to see in a modern Imperial Guard force. This is the last unit I painted for this army (not including vehicles) about 5 years ago. Looking at them now I can see my painting has come on a lot! I was quite pleased with them at the time - now not so much. Still - I have no plans to repaint any of my troops - just rebasing them which is making a big difference to how they look anyway. 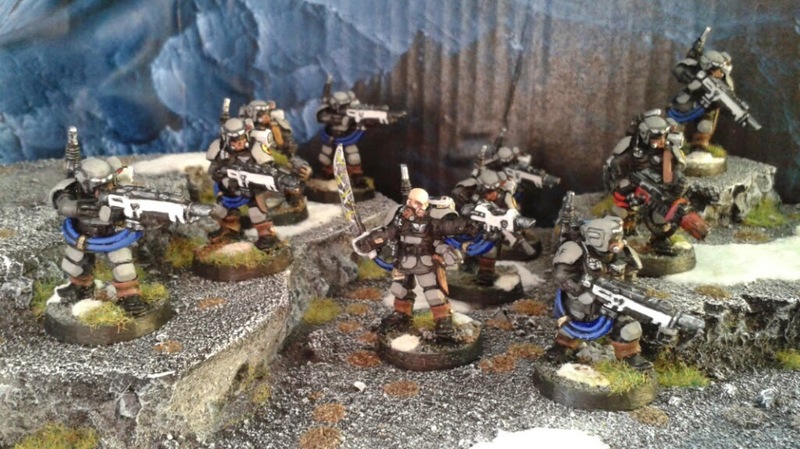 I still prefer these minis to the new Militaris Tempestus Scions, though.